The body does not cry…. 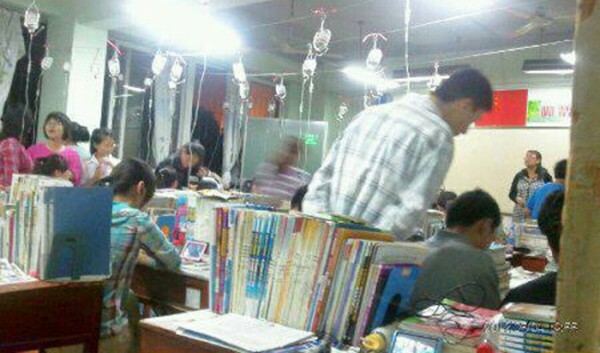 Young Chinese students dope themselves to get a good exam, I read today and was shocked. Middle school says the students are injecting amino acids to replace energy. Which the students needed to prepare well for the exams “gao kao”. Going to school is truly very exhausting, the students say. We get up every day at 8:30 am, coming home at 10:30 pm at night. On the one hand one could talk about the school system and the relevance to what learning means and how learning functions. On the other hand I would say something about what is happening to the body and the inner self of the students when they they do so……………………..
Learning and studying is important to gain and improve knowledge, competence, dialogue. It is also a very natural way of development one´s own personality, one´s own competence for life. Learning means to develop and improve on the body level. To feel familiar in the field of emotional acting. And to get a sense for what you are doing and why you do so. So learning stands for ( social ) life, future and personality. It makes me sad when one student says : How is this studying, it’s clearly risking one’s life, risking not one’s learning ability but one’s physical health. Right now I remember the role and function of the body and bodily health in China. Without “body” there is no sustainability for us, the other and for our children. Get up at 8:30 am? How happy are the students in Peking! I got up every day at 6:30 am when I was a student. “Gao kao” strangles the talents in the cradle. Always so.